How to select the correct dehumidifier? The above calculation sheet gives you the exact size of the dehumidifier required for your application. You are entering the input values of present conditions of your home, office, warehouse, cold room, walk in freezer etc. The result calculated give you the exact capacity of the required dehumidifier. If the area is big, it is better to select multiple dehumidifiers so that air circulation will be better. Also, this will help in faster dehumidification. How to calculate dehumidification capacity using the above calculation sheet? The input parameters are explained below. You have to enter these input values and press the button 'Click here for Dehumidifier result'. You have to enter the normal room temperature. In order to calculate the worst possible scenario, you may consider the highest temperature recorded during a certain period. Eg. If you have a high humidity in winter, you may enter the highest reading normally noticed during the winter. However please note that you as you enter a high value, the size of the required dehumidifier will be higher, thus increasing the cost. You have to input the present levels of humidity in this column. In order to calculate the worst possible scenario, you have to enter the highest readings normally recorded. If you want accurate results especially for industrial and commercial applications, you may take the actual readings using a hygrometer. If you are designing a warehouse with opening to the atmosphere, you can easily check the data from your local weather reports. However if you are designing for an office, you will need to measure the exact readings. However, for small office and homes, you may need such exact readings. This is the humidity level you need to achieve by installing the dehumidifier. For a home or office, you will need to maintain a humidity in the range of 40% to 60%. If you want to store medicine inside a walk in freezer, you will need to maintain a maximum humidity of 60-65%. You can input this value in this column. In these columns you have to input the size of the area, which is being dehumidified. As the capacity of the dehumidifier is directly dependent on the air volume inside the room, the size of the room is very important. You can input length, width and height in meters. Alternatively, if you know only the volume of the room, you can input the same in cubic meters. After entering the above values, click on the button 'Click here for Dehumidifier result'. Now you will see the results. The results are given in kg/hr or liter per given. Also, the result is given in US pint/hr. This is the amount of water to be removed from the air per hour. Capacity of a dehumidifier is defined by the amount of water it removes per hour or per day. The capacity is also given for a full day. Now you can select a suitable dehumidifier, which meets this capacity. Note: The calculation is issued for guidance only. We do not undertake any contractual obligations whatsoever for the results or the calculation method. 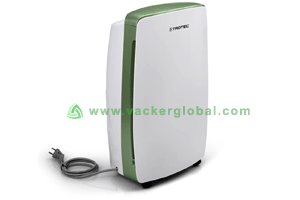 How to select dehumidifiers after calculating the capacity? Based on the above results, you can select a suitable dehumidifier from our wide range of following dehumidifiers. For all commercial and industrial applications, you may contact our experts for a free assistance. Swimming pools generate huge amount of moisture and cause huge problems to the surrounding areas. The calculation sheet above is not applicable for swimming pools. You may contact us for evaluation of the same. Please go through our range of swimming pool dehumidifiers. These are comfort series of sleek and silent dehumidifiers. These come in various sizes and shapes to suit your ambience. For your convenience we have also listed the recommended room size for these models. In such cases you do not have to necessarily do the above calculation. However for exact calculations, you may calculate the required capacity as above. Basements always have a problem of high humidity since moist air is heavy and tends to settle as low as possible. Also it will not rise automatically to the ground level. If humidity is not controlled in time, it will cause huge damage. Please see more on our basement dehumidifiers. These dehumidifiers are for various industrial and commercial applications. Applications include warehouses, factories, restaurants, hotels, auditorium, construction sites, diary farms, breeding farms etc. Please see our wide range of commercial dehumidifiers. This is the major type of dehumidifiers by means of technical classification. Condensation principle is condensing the water of the atmosphere and converting into water. This water is drained out this reducing the humidity of the room. Please see more on condensation dehumidifiers. This is the second type of dehumidifiers, which operates using desiccants. They use a moisture absorbing material such as silica gel to absorb the moisture. This will not produce water. These are especially useful for low temperature below 10°C. Please read more on desiccant dehumidifiers.